Tag Archives: You cry a lot . Don’t be a cry baby and act like an adult. 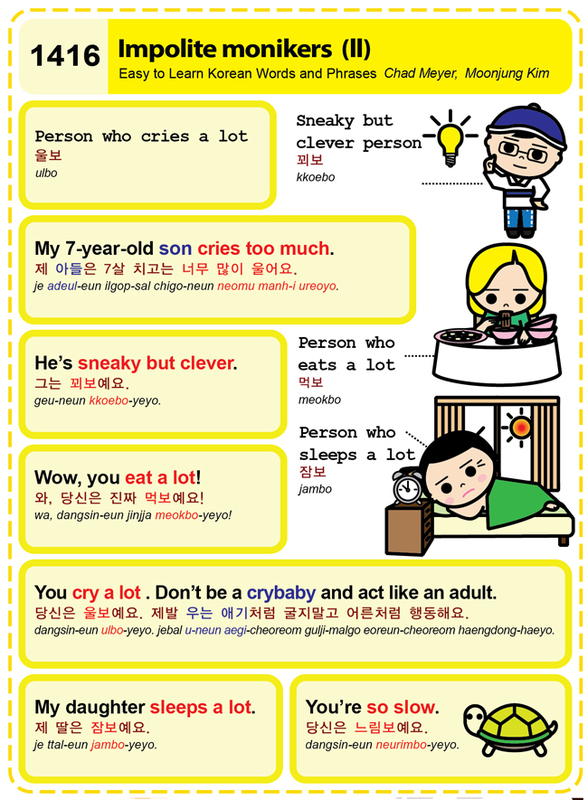 Easy to Learn Korean 1416 – Impolite monikers and nicknames (part two). Posted in Series	| Tagged cry baby, He’s sneaky but clever., impolite monikers, My 7 year old son cries too much., My daughter sleeps a lot., person who cries a lot, person who eats a lot, person who sleeps a lot, sneaky but clever person, Wow, You cry a lot . Don’t be a cry baby and act like an adult., you eat a lot!, You’re so slow., 그는 꾀보예요., 꾀보, 당신은 느림보예요., 당신은 울보예요. 제발 우는 애기처럼 굴지말고 어른처럼 행동해요., 당신은 진짜 먹보예요!, 먹보, 와, 울보, 잠보, 제 딸은 잠보예요., 제 아들은 7살 치고는 너무 많이 울어요.